Finally, a new FREE pattern for you guys, and I made it into a cool, fancy PDF too! So I was bored one day and wanted to make a bow tie, I looked all over for patterns on making one, but all I could find were patterns for pre-tied bow ties, and where’s the fun in that! So I made my own :). I thought, well since there aren’t any I could find, I might as well post one. 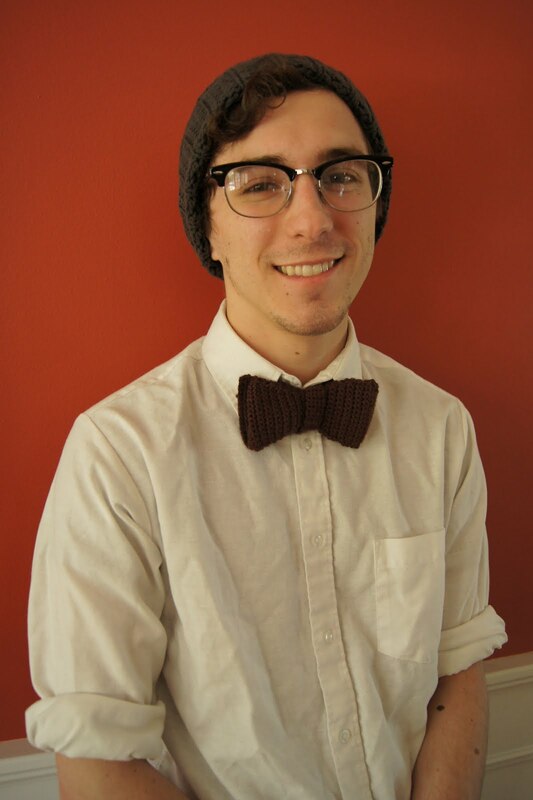 You can buy one of these bow ties too, right here. Here are some photos, scroll down to view and download the pattern. So here’s the free pattern for download via Ravelry. Here’s the dealio, I want to be able to give all my patterns for free, and I would if I could, but I can’t. I can’t because it takes lots of time to make them and make sure it looks pretty, and I’m a student and don’t make a lot of money as it is, so here’s my idea, if you like this pattern please hit the button to the top right to donate a little something; you don’t have to (obviously) but it would mean a lot to me and show me that people do want more patterns. 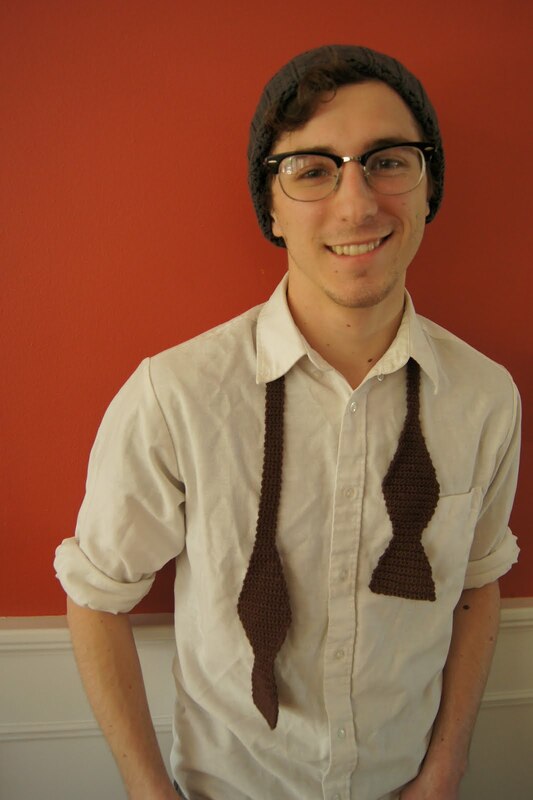 This entry was posted in Blog, Bow Tie, Free, How to, Pattern on March 25, 2012 by Louis Mensinger. Just found your site, and I love it! I might try to make a mini version of this for my son. Thanks! how long do you make the Rnds 49-199 for a 15 1/2 inch neckline? I think you would continue Rnd 49-199 until it equals 15 1/2 inches, but I'm not entirely sure. The best way is to probably get a bow tie that you know fits, measure it from end to end and make you're entire piece that long. It all depends on your gauge. Measure Rnds 1-49 and multiply it by two, then subtract that number by how long the bow tie you know fits is and you'll get the length of Rnds 49-199; it will probably be 15 1/2 inches (I think). Sorry if that just confused the crud out of you haha. I would be confused too. Let me know if that helps at all! I never properly thanked you! So, Thank you! Haha. It's a shame that the service you are using, is now telling people that they have to be a premiun (paying) member in order to download a free pattern. Did you know that they "changed their policy"? I had a couple of grandson's that would have liked this. I'm trying to make this tie as a surprise for someone, I know they have about a 14" neckline but don't know long to do those rounds because I'm guessing a little extra is needed to do the actual tying? Does anyone know how much extra I might need to allow? It doesn't have to be a perfect fit but I was just wondering roughly how much longer than your actual collar measurement that part of the tie would be usually (if that makes any sense), I don't own any myself so can't check. How long is the bow tie if following the pattern exactly? thank you so much you are so awesome! We have a lot of Mensingers in the town I live in. My husband's mother was a Mensinger. The town is Camanche, Iowa. Do you think you could be related to the people here?